Bangladesh’s elite force (RAB) have seized 2.8 million methamphetamine tablets worth an estimated $10.5 million and nabbed three smugglers from Dhaka and seaport city Chittagong in separate drives. RAB members have claimed that this is the biggest ever seizure of contraband methamphetamine tablets, well known as Yaba tablets, in the country witin a day. Spokesman for the RAB Major Maksudul Alam told local media that three people including a top smuggler were arrested in connection with the seizures in Dhaka and Chittagong, 242 km southeast of the capital city, in the drives from Sunday night to early Monday. Yaba tablets are often used for sexual stimulation in Bangladesh and have gained increasing popularity among drug users. Alam said this is the biggest Yaba haul of the country yet. He said one of the three arrested was Ali Ahmed who, he described, as the kingpin of the drug-peddling racket in the South Asian country. Yaba, a Thai word for “crazy medicine”, is made of methamphetamine and caffeine. 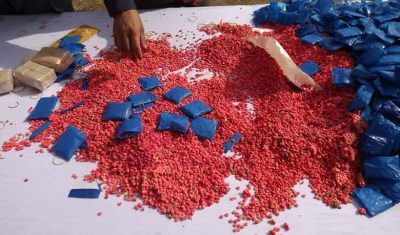 Police and border forces in Bangladesh’s southern Teknaf, which borders Myanmar, seized hundreds of thousands of Yaba tablets in recent months. Last month a suspected Myanmar Yaba smuggler, who was injured in a “gunfight” between his cohorts and Bangladesh border guards along the Naf River in Teknaf, died from his injuries in a Bangladesh hospital. The drug reportedly mainly comes from Myanmar with which Bangladesh shares 271 km of border, 208 km along the land and 63 km along the river. The drug is also reportedly smuggled into Bangladesh by air and land routes from some other countries in the region, including Nepal and Thailand.